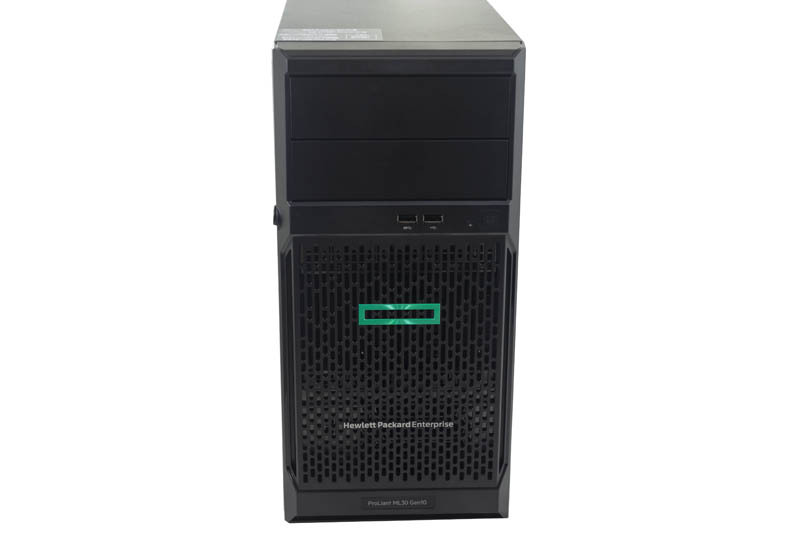 In our HPE ProLiant ML30 Gen10 review, we are going to show why this is an excellent option for companies looking for an edge server. Based on the newest Intel Xeon E-2100 series processors, the new HPE ProLiant ML30 Gen10 offers significantly more computing power than previous generations. We are going to start our tour of the HPE ProLiant ML30 Gen10 by first looking around the outside of the unit. We are then going to open it up and see what makes it work and what some of the additional expansion possibilities include. Size wise, this small tower server sits between the HPE ProLiant ML110 Gen10 and the HPE ProLiant MicroServer Gen10. The overall positioning is between the two, and the size matches. While the MicroServer Gen10 is a fraction of the size, it also pales in comparison to the ProLiant ML30 Gen10’s performance and expandability. Likewise, the HPE ProLiant ML110 Gen10 is a larger chassis but can handle significantly more cores, RAM, and add-in devices. Behind the faceplate is how one accesses the storage. Unlike the Dell EMC PowerEdge T140, the HPE ProLiant ML30 Gen10 has traditional hot swap bays. 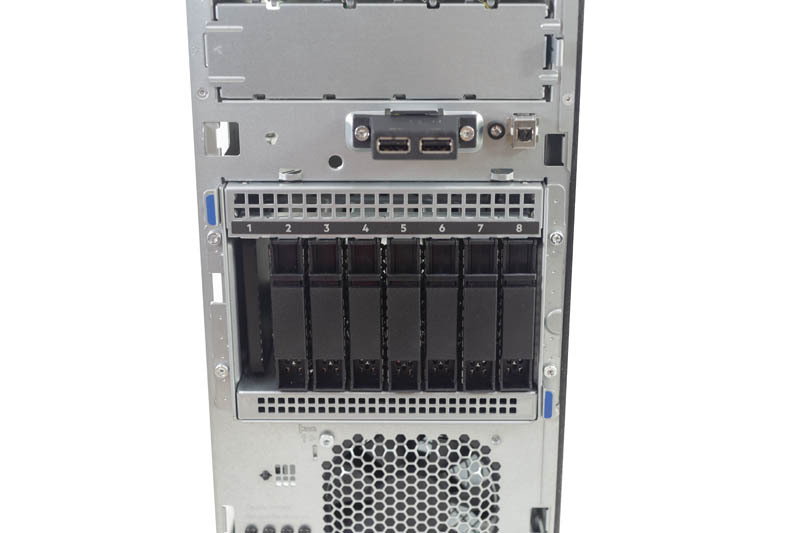 Our test unit has an 8x 2.5″ bay configuration, but the company offers other options as well. One can see that the bay is easily swappable for different storage types. On the rear of the tower chassis, we see a relatively simple design. We are going to cover the major points. 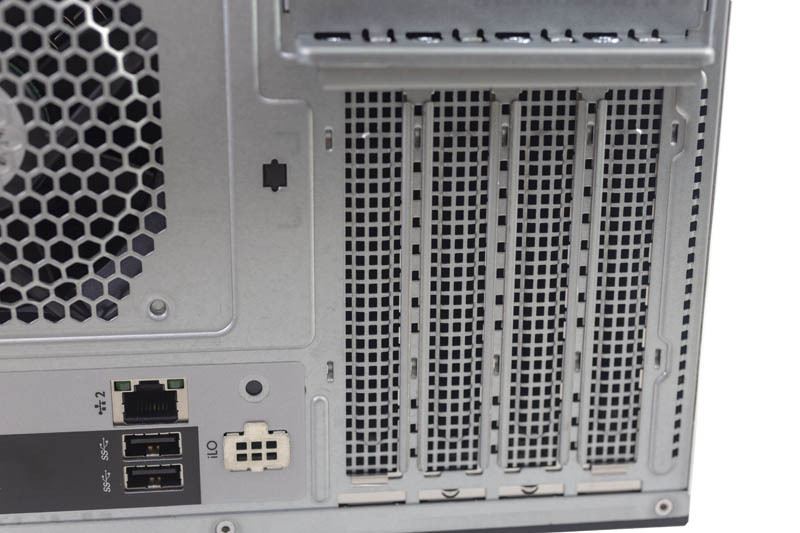 On the right side, there are four PCIe expansion slots. 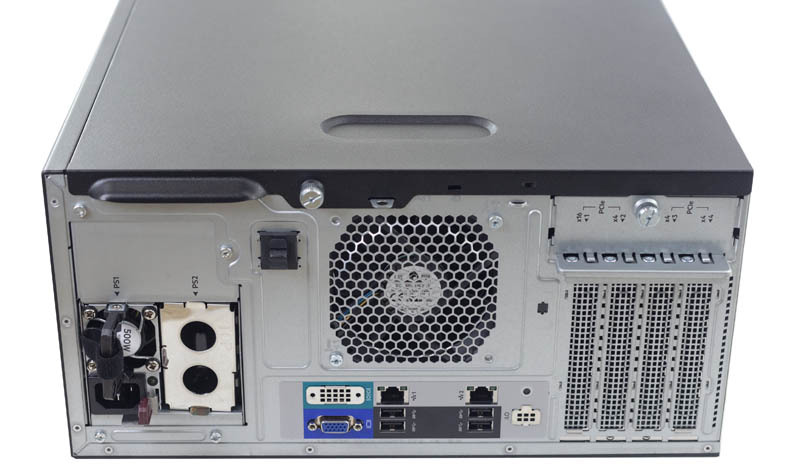 If you wanted to, for example, add a PCIe network card, this is where the rear I/O would be. The Rear I/O has four USB ports as well as a legacy VGA port for local KVM access. One will notice that our test unit has two conspicuously absent ports: the serial COM port and iLO. A COM port is easy to add but the test unit does not have a dedicated out-of-band management port for iLO. In many places that these are deployed Ethernet ports are few and far between and dedicated management switches are rarely if ever seen. Instead, HPE suggests on using one of the two 1GbE network ports and have of the NICs set up in a shared mode where the management interfaces are over the same wire as the server’s network interface. This cuts down on costs and typically one will use VLANs to segregate network traffic. 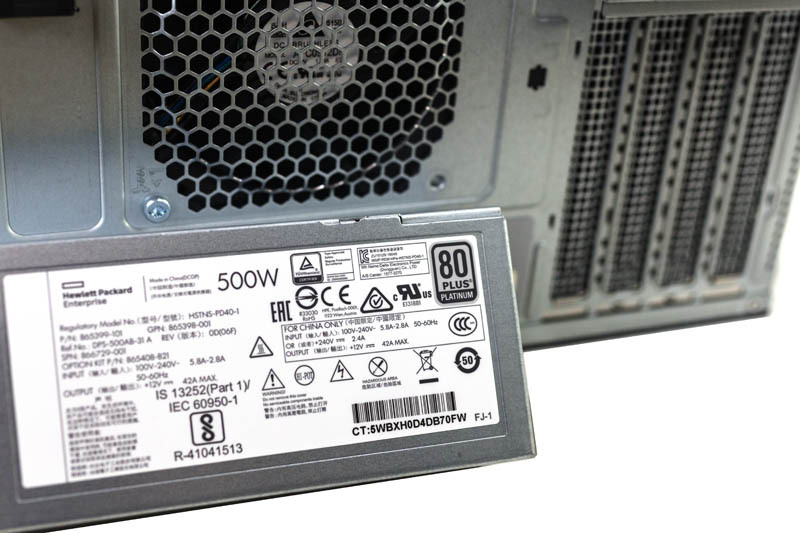 Our test unit was equipped with a 500W 80Plus Platinum redundant power supply. This is a high-efficiency power supply and redundant options allow for configuration flexibility with battery back up units for example. Opening up the cover used thumb screws. We wish that HPE used a nice latching mechanism instead. 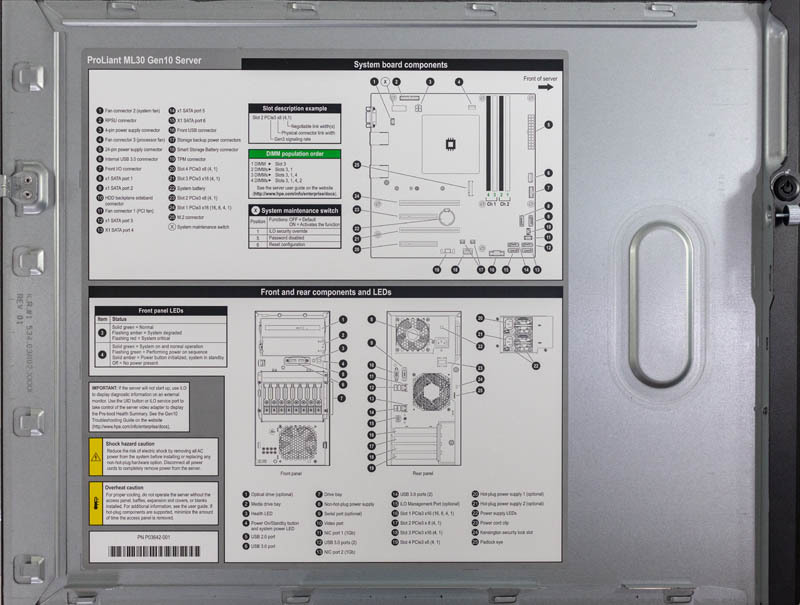 Inside the cover, we can see that the diagrams show the key components of the server. This can help when one needs field maintenance and a non-technical professional needs to be guided on servicing the machine. With that overview completed, it is time to look inside the HPE ProLiant ML30 Gen10. 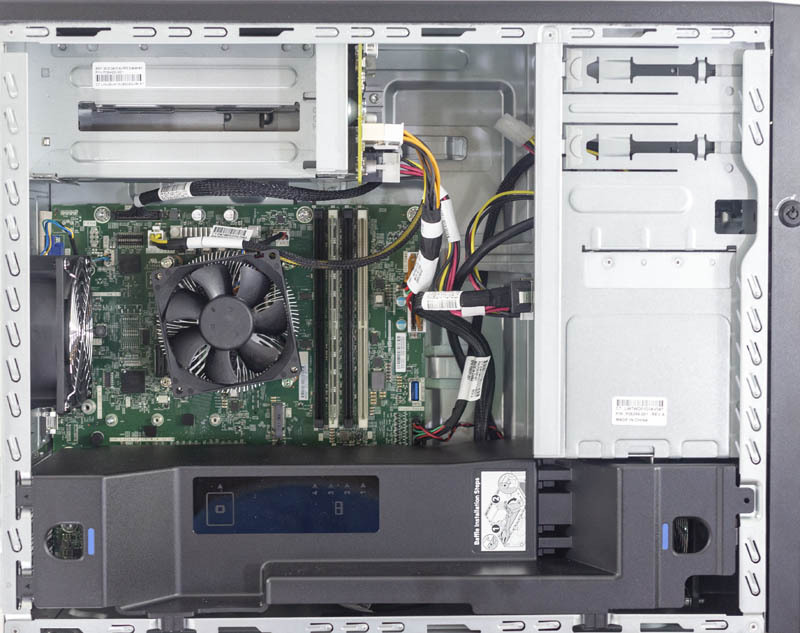 In our HPE ProLiant ML30 Gen10 review, we show how this server compares to other HPE tower server offerings like the MicroServer Gen10 and ML110 Gen10. We discuss what sets it apart from previous generations and its competition in the space. We use the ML30 Gen10’s for our branch offices (real estate company) and they work well. We’re using the 3.5″ versions. The new 6C E-2146G’s are what we bought based on the STH review and we’re really happy with them. HPE became too geedy, as you could see with the iLo license. But the worst part is when you need a firmware/BIOS update and the server/adapter you have is out of warranty and you don’t have a service contract with them, then you can’t download any updates. I have the previous gen of this server. It’s been going strong for a few years now. Only downside to ours it only takes 32gb ram due to the cpu ram limit of the Xeon e3 we have in it. I really like the quality review you guys do and welcome the amazing changes to ILo 5. Could you please review some of Talos II systems? Yep, since they restricted firmware updates only to clients with contract we now only buy Dell. The difference between Dell and HP is usually small enough that these little issues are enough to justify one vs another.